They call this cover of the New York Post, satire. "The Politics of Fear", it's called. It's a drawing of Obama and his wife, Michelle. 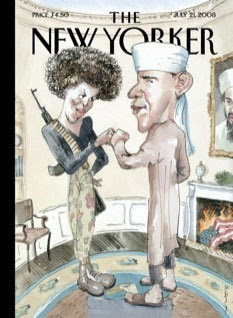 She looks an awful lot like the revolutionary, Angela Davis. And, clearly it is satire. revolutionary waiting to shoot up "whitey", know it's satire. But, there are a lot of backward, mouth breathing Red State voters who won't see the satire. They won't "get" the message. No, they'll sit back in their ratty lazy boys, drinking a Bud, smoking a Marlboro and drooling over Bill O'Reilly's spin of the cover and mutter, "I told you so!" The Republicans are counting on that. Can we expect a cover next month of McCain? Perhaps a drawing of him laying in a hospital bed looking up at Cindy (who's drinking a Bud and popping a few pills), with IVs in his arm, a huge tumor on the side of his face, holding a grenade and wearing a "Depends"?